OSIM Sundown Marathon’s event organiser, HiVelocity, has apologised to runners for a delay in collection of their race packs. The delay, which angered many participants, was approximately two to three hours. This year’s title sponsor was OSIM. So what led to the delay? Well, in line with one of its partners WWF, HiVelocity decided to alter the collection process of its race packs. Instead of pre-printing running bibs, the organisers decided to implement the printing of the bib on-demand. This was to negate the chances of having an excess of bibs and reduce wastage. However, part of the shipment for these special printers to print the bibs could not arrive on time, resulting in us operating with a less than optimal capability. Adrian Mok, founder of Sundown Marathon and managing director at HiVelocity, explained in a Facebook post that the firm had also tested the concept of dispensing the race pack over a vending machine, and this change was in sync with the new technology. It had also tested this system before at a smaller-scale events which had positive outcomes. As such, the team was confident of expanding the process to handle the larger crowd at Sundown, said Mok. 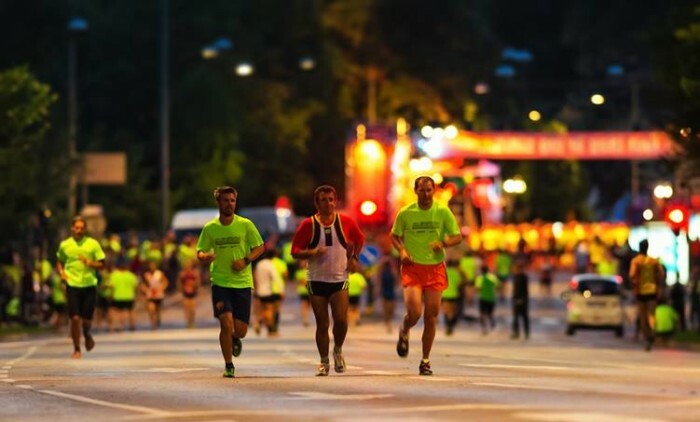 “The idea came from a sincere desire to champion a more sustainable approach for Sundown Marathon. As such, we put in place new measures that aimed to leverage on technology, and to cut down on wastage,” Mok explained. However, the new concepts proved to be ineffective due to bad weather and technical difficulties, leading to delays for as long as two to three hours in the race pack collection process. This led to a slew of angry complaints from racers on its Facebook page over a period of three days. However all was not lost as the team saw great collaborative effort from several sponsors and partners. Title sponsor OSIM mobilised its team of volunteers to aid the event organiser with manpower. Meanwhile WWF provided hydration dispensers and umbrellas for racers in the queue, and Sheng Shiong and food vendor AMGB helped distribute food and water to participants in the queues. “The aim of the marathon is for everyone to have a good time, so we (OSIM) did what we could to help the organizers ease the situation, to try and reduce the inconvenience to participants,” a spokesperson from title sponsor OSIM, said. It has always been the Sheng Siong “All For You” spirit to serve and help out wherever we can, not only for our customers, but also the greater community. According to Mok, by the fourth day, the company found ways to negate the waiting time. This involved pre-printing remaining uncollected race bibs to improve the speed of collection, setting up more laptops to improve speed of collection and re-introducing the check-in system for runners who did not wish to queue up to collect their race packs the conventional way. 2016 was one of the hardest years for the industry with terrorist attacks in France, the Brexit vote in the United Kingdom, and th..